This morning I emailed the pastors of the WLA Association whose churches are listed below asking them to confirm the following dates for the WLA Traveling Choir to sing at their congregations this school year. I am posting these dates to aid WLA families and students in planning their schedules for the upcoming school year. I do anticipate some changes (there always are! ), so don't cast these dates in stone yet. I'll post confirmations and changes as I get them. Did the Underground Railroad run through Fond du Lac, WI? If Day 1 was 1st Quarter and Day 2 was 2nd Quarter, end of the first semester, Day 3 (yesterday at the time of writing) was the 3rd quarter, or the 1st quarter of the 2nd semester of a year long guitar program. I don't think I'd ever get to these topics in my Music Technology guitar unit, but if I would ever get a full blown guitar class started at WLA, I'd a have a very good idea of the progression of topics in a guitar curriculum. That and a number of methods books that we'd referenced have teacher's manuals with full blown 180-day lesson plans, complete with performance rubrics, quizzes, and tests. 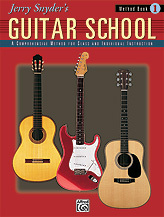 Everything a guitar teacher and student needs! Rob started us with tuning to a CD, I think the 1st track of the Essential Elements CD, but probably any CD that comes with a guitar methods book has a tuning track on it. Mel Bay's Classical Guitar Method Grade 1 (p. 11) - Daily Left Hand Exercises and Daily Exercises (p. 77). One of the things I learned is that the 5th position on the neck of the guitar (when the 1st finger is in the 5th fret box and every finger falls in the next ascending adjacent fret boxesis a good position to warm up in because the frets are spaced closer together than the 1st position (when the 1st finger is in the the 1st fret box). These exercises involve lifting a placing the four fingers of the LH on the strings independently of each other in various orders and combinations from the 1st through 6th strings and from the 6th to 1st. Right Hand Staccato Exercise: downstroke, stopping the string vibration by upstroking and stopping the pick on the underside of the same string. Then upstroke, stopping the vibration with a downstroke that only rests on the string. Practice in slow succession, then gradually increase speed. H.O.T. First Year Guitar (p. 31) - mastery of the note names should be accomplished by the end of the 1st semester (Shelley made this the 1st week's performance assignment by Friday). Use trio exercises (pp. 32-35) to reinforce. Have students name the 1st note name, string, fret and finger (e.g. E 6-O) before starting so you know they know where they are starting on the neck, OR have them name all the notes in these exercises in the same fashion before they play. If they can name them, they can play them because the brain needs to know where to place the finger to sound the note! Jerry Snyder Guitar School Method 1 (p. 95) - chromatic scale warmups. 1st position is the "workout" position. Use 5th position for warmups. Beginning student should use quarter notes. More advanced students can play eighths, triplets, or sixteenth notes. Essential Elements for Guitar, Book 1 (p. 65) - eighth notes downpicking with foot. Downpick and up-pick symbols are identical to string bowing downbow and upbow symbols. RULE: Downpick on downbeats. Uppick on upbeats! Mel Bay's Mastering Guitar Class Method (p. 77) - C Scale. Practice in 4-note groups ascending and descending using the Downstroke/Upstroke Rule. Shelley uses a plastic sheet protector as a poorman's whiteboard to hand out to her guitar students. Inside is a colored sheet of paper with three vertical neck diagrams and three blank staves on one side with a giant neck on the other side. Overhead markers can be used to write "answers" on these sheet protectors. Cooperative learning- check that your neighbor has the same answer (by colored sheet). Essential Elements for Guitar, Book 1 (p. 64) Wayfaring Stranger Dm, Am and C = 1st and 2nd fingers common! Essential Elements (p. 83) E7 Good Morning Blues (E E7 A7 E B7 A7 E) Cool! Play with shuffle feel. 21st Century Guitar Method, Alfred EL03842CD (p. 34) Why play "power" chords? Because 3rds (in chords) don't work well with electric guitars and distortion. This seems to speak to also why a guitar class should play nylon string acoustic guitars rather than rock out on electric guitars. "Power" chords drop the 3rd of a triad, rendering the "chord" neither major nor minor, but just an open 5th (aka a "perfect 5th"). "Power" chords are "the chord" of rock and metal music. Want to sound like the real deal? Gotta play the style! (p. 44-46) Blues Boogie Pattern I was SO EXCITED to see this pattern in print! It's the same pattern I taught my Music tech students when we did our Blues Project! (affirmation...Yes! *fist pump*). We learned the A5, D5, and E5 power chords separately, adding the A6, D6, and E6 "power chords" by adding a 4th finger to the same string that the 2nd finger was playing the original power chords. Switching back and forth between X5 and X6 power chords gives a Chuck Berry feel! The whole progression was playing in The Boogie Progression (p. 45) and put into a song in Old Time Rock and Roll (p. 46), a culmination of learning the I, IV, V progression on power chords in A. We played the rhythm guitar part, but the melody was also written in notation and TAB for more advanced students. Metronome Practice: Rob recommended using incremental metronome practice for teaching chords and notes. When learning a song (i.e. chords), start slowly (eg. 90 bpm) and gradually increase the tempo by 10 bpm increments until you hit your performance tempo (or the CD accompaniment tempo). When learning a melody (i.e. notes), step up to performance tempo by 5 bpm increments. H.O.T (p. 42-43) Unit Three: Playing Bass. The power chords that Rob taught in session 2 work when the root is on an open string (E5, A5, D5). Knowing where the root and 5th are for any note makes a moveable power choir. From the root pitch, the 5th is one string toward the floor and two frets toward the bridge. This shape can be slid around the neck. Played with 1st and 3rd fingers, moveable power chords enable you to rock out in any key on any root, such as 25 or 6 to 4: A5, G5, F#5, F5, E5 (sounds like Green Day's Brain Stew) or Nirvana's Smells Like Teen Spirit: F5, Bb5, G#5, C#5. We also learned the F chord (strings 1-4, barring strings 1 & 2 at the 1st fret) and played The Old Grey Mare (p. 105). Half the class played root/5th alternating half notes while the other half strummed the chords. The same procedure was applied to p. 42-43 above.